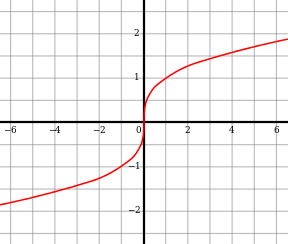 Plot of y = 3√x. The plot is symmetric with respect to origin, as it is an odd function. At x = 0 this graph has a vertical tangent. The cube root operation is not associative or distributive with addition or subtraction. In some contexts, particularly when the number whose cube root is to be taken is a real number, one of the cube roots (in this particular case the real one) is referred to as the principal cube root, denoted with the radical sign 3√. The cube root operation is associative with exponentiation and distributive with multiplication and division if considering only real numbers, but not always if considering complex numbers: for example, the cube of any cube root of 8 is 8, but the three cube roots of 83 are 8, −4 + 4i√3, and −4 − 4i√3. For any real number y, there is one real number x such that x3 = y. The cube function is increasing, so does not give the same result for two different inputs, plus it covers all real numbers. In other words, it is a bijection, or one-to-one. Then we can define an inverse function that is also one-to-one. For real numbers, we can define a unique cube root of all real numbers. If this definition is used, the cube root of a negative number is a negative number. If x and y are allowed to be complex, then there are three solutions (if x is non-zero) and so x has three cube roots. A real number has one real cube root and two further cube roots which form a complex conjugate pair. This can lead to some interesting results. The last two of these roots lead to a relationship between all roots of any real or complex number. If a number is one cube root of any real or complex number, the other two cube roots can be found by multiplying that number by one or the other of the two complex cube roots of one. This means that in polar coordinates, we are taking the cube root of the radius and dividing the polar angle by three in order to define a cube root. With this definition, the principal cube root of a negative number is a complex number, and for instance 3√−8 will not be −2, but rather 1 + i√3. 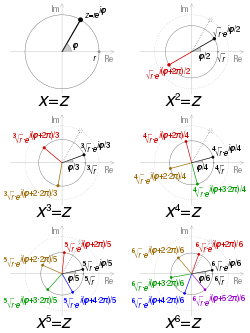 Visualisation of the square to sixth roots of a complex number z, in polar form reiφ where φ = arg z and r = |z | — if z is real, φ = 0 or π. Principal roots are in black. Unless if x = 0, these three complex numbers are distinct, even though the three representations of x were the same. For example, 3√−8 may then be calculated to be −2, 1 + i√3, or 1 − i√3. Cube roots arise in the problem of finding an angle whose measure is one third that of a given angle (angle trisection) and in the problem of finding the edge of a cube whose volume is twice that of a cube with a given edge (doubling the cube). In 1837 Pierre Wantzel proved that neither of these can be done with a compass-and-straightedge construction. With either method a poor initial approximation of x0 can give very poor algorithm performance, and coming up with a good initial approximation is somewhat of a black art. Some implementations manipulate the exponent bits of the floating-point number; i.e. they arrive at an initial approximation by dividing the exponent by 3. This has the disadvantage of requiring knowledge of the internal representation of the floating-point number, and therefore a single implementation is not guaranteed to work across all computing platforms. The second equation combines each pair of fractions from the first into a single fraction, thus doubling the speed of convergence. The advantage is that x and y are only computed once. Cubic equations, which are polynomial equations of the third degree (meaning the highest power of the unknown is 3) can always be solved for their three solutions in terms of cube roots and square roots (although simpler expressions only in terms of square roots exist for all three solutions if at least one of them is a rational number). If two of the solutions are complex numbers, then all three solution expressions involve the real cube roots of two real numbers, while if all three solutions are real numbers then each solution is expressed in terms of the complex cube roots of two complex numbers. Quartic equations can also be solved in terms of cube roots and square roots. The calculation of cube roots can be to traced back to Babylonian mathematicians from as early as 1800 BCE. In the fourth century BCE Plato posed the problem of doubling the cube, which required a compass-and-straightedge construction of the edge of a cube with twice the volume of a given cube; this required the construction, now known to be impossible, of the length 3√2. A method for extracting cube roots appears in The Nine Chapters on the Mathematical Art, a Chinese mathematical text compiled around the 2nd century BCE and commented on by Liu Hui in the 3rd century CE. The Greek mathematician Hero of Alexandria devised a method for calculating cube roots in the 1st century CE. His formula is again mentioned by Eutokios in a commentary on Archimedes. In 499 CE Aryabhata, a mathematician-astronomer from the classical age of Indian mathematics and Indian astronomy, gave a method for finding the cube root of numbers having many digits in the Aryabhatiya (section 2.5). ↑ Smyly, J. Gilbart (1920). "Heron's Formula for Cube Root". Hermathena. Trinity College Dublin. 19 (42): 64–67. JSTOR 23037103. Computing the Cube Root, K. Turkowski, Apple Technical Report #KT-32, 1998. Includes C source code. Weisstein, Eric W. "Cube Root". MathWorld.